The lessons for Sunday can be found here. I worked most closely with Ephesians 5:15-20. The lessons for Sunday can be found here. I worked most closely with Ephesians 4:25-5:2. “Be angry but do not sin.” Ummmm….that’s trickier than it sounds. My mother wore her hair long until cancer and chemotherapy left her bald. I remember her telling me, from the first of many hospital beds, that she’d chosen to have them shave her whole head. As far as I can remember she handled baldness well with wigs, scarves, and bare scalp. A few years and inches of hair later, I remember her combing through my even longer hair after her cancer returned and was rediagnosed as we talked about her hair. I mentioned how much I looked forward to her hair growing out again and she said, gently, that that was never going to happen. That was the moment when I really knew she was going to die. I remember when my second brain tumor was diagnosed and my neurosurgeon mentioned radiation. I read and read and read research. Surgery, yes, radiation, no. ‘No’ in part, in large, because I could not take the thought of that loss on top of the rest of a horrid year. ‘No’ until after my third tumor was found and removed 3 years later. I remember collecting handfuls of hair every night for weeks. I never went bald. In fact, I have so much hair no one else noticed. But there was something about the drain-clogging hair loss that was extra real. After spending most of the last year debating, I cut my hair today. By a lot. 12+ inches. I know what I’m doing. I’ve done this exact thing before–four other times if I’m remembering correctly. I like shorter hair (shoulder length now). I like long hair. So from time to time, I go back and forth. 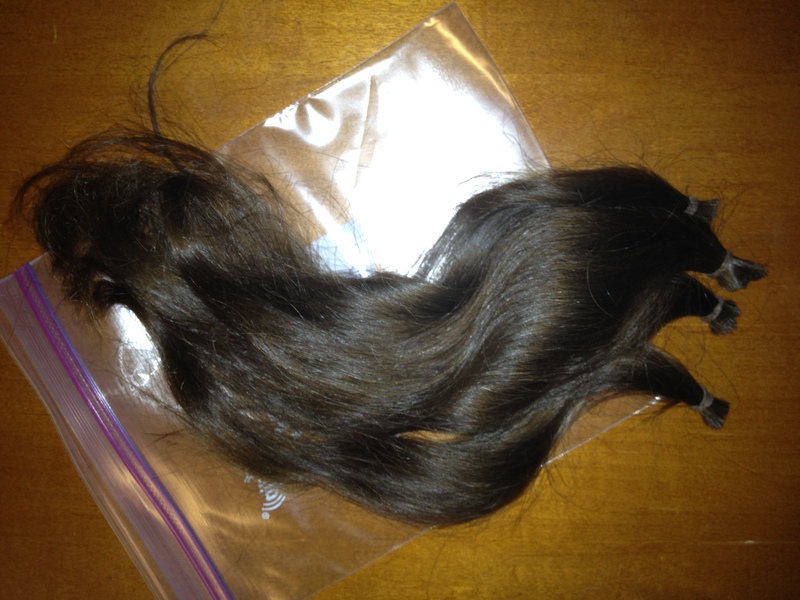 Whenever I do cut this much hair off, I donate it. So my pony tail of superfluous hair goes out in tomorrow’s mail. Not because I’m a good person. Because I know about hair loss. Because this particular loss, this particular grief, is mine too. We are all more injured, more scarred than we often think. In this we are alike. Just a little. The lessons for Sundayshe can be found at this link. I worked most closely with Ephesians 4:1-16. The author of Ephesians starts this section of his letter with a passage on Christian unity. Which is always a bit difficult and something we practice.